Crotons are houseplants that normally have variegated leaves with shades of yellow, red, and green. They were originally found in Indonesia so they do well in the warm climates of our houses. They are a fairly easy plant to grow indoors if you follow the care instructions listed below. 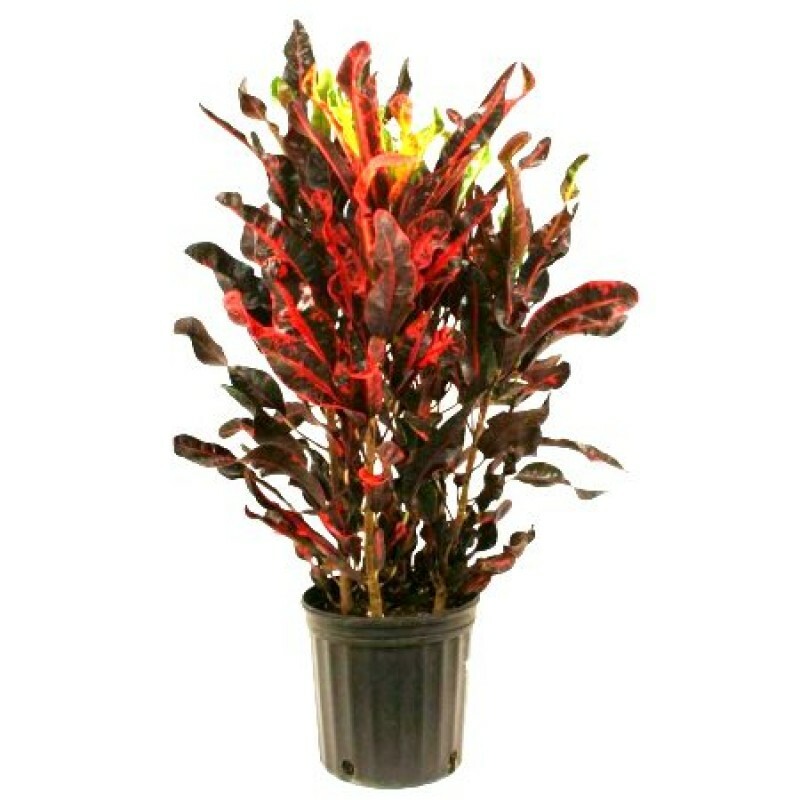 Crotons need a very brightly lit location so that they keep their bright colors. They enjoy a western or southern window location. If they have plenty of light the leaves will have more variegation and the colors will be brighter. They need to be kept at a minimum temperature of 60°F during the night and around 70°F during the daytime. If they aren’t kept at this temperature they will begin to drop their leaves. Crotons need to have their soil evenly moist at all times, they tend to wilt easily if the soil is too dry. On the other hand if the soil is too wet the leaves will turn brown on the edges. These plants also prefer to have a location with higher humidity. It is generally recommended that they be placed somewhere with a humidity of 40-80%. If the humidity isn’t high enough the plants will drop some of their leaves and the color of the leaves may not be as vibrant. The most common problem that people experience with crotons is spider mites. If the humidity is too low this tends to make them very susceptible to spider mites. The best way to get rid of the pests is to apply a miticide and mist them daily. Plant crotons where they will receive direct sunlight for at least six to eight hours a day. They can grow as tall as 6 feet and up to 3 feet wide with enough light. Their green leaves turn to shades of yellow, red and purple throughout the year, showing their brightest colors in the sun in cooler months. Crotons are evergreen plants and will continue to grow throughout winter, when they show off their colors. Crotons grow best at between 60 and 85 degrees Fahrenheit. Lower night or seasonal temperatures will not harm the plants, as they are hardy enough to withstand temperatures as low as 40 F. However, it is wise to cover a bed of crotons or bring potted ones indoors if a frost is expected. The plants can tolerate heat as high as 100 F, but should have some shade in areas that experience severe heat. Well-drained soil works best for growing crotons outdoors so the soil can dry between waterings. Pots should provide good drainage, as well. Water the plants when the top of the soil is dry. On especially hot days, you may need to water the crotons twice a day. Crotons like humid weather, and misting the plants throughout the hottest days of summer will help the leaves stay bright and healthy. Outdoor crotons require fertilizer with a recommended ratio of 3-1-2 (3 percent nitrogen, 1 percent phosphorus and 2 percent potassium). Liquid or gradual-release granular fertilizer work well, using amounts listed on the packaging. Too much fertilizer can damage the roots and cause the leaves to be dull instead of bright and shiny. Although crotons are generally pest-free, they can be affected by a few garden pests. Mealybugs are a type of scale insect that show up as white cottony masses. Mites are eight-legged insects that cause the leaves to become curled or speckled. Thrips are commonly called "greenhouse thrips," and often attack newly developed plants. They leave scarred or calloused spots where they feed. These pests can be treated with a pesticide developed for tropical plants or houseplants. plants height with pot is 1.5 feet and pot size is 5 icnhes diameter.